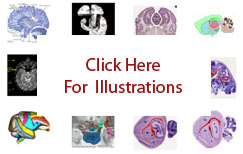 The term anterior hypothalamic area refers to one of seven divisions of the anterior hypothalamic region as defined on the basis of Nissl stain. It is located in the medial zone of the hypothalamus, for the most part between the medial preoptic area rostrally, the dorsomedial nucleus of the hypothalamus caudally; the periventricular zone of the hypothalamus medially and the lateral hypothalamic area laterally. In the human it is undifferentiated ( Saper-2004 ). In the macaque an anterior part of the anterior hypothalamic area is distinguished from the remainder ( Paxinos-2009a ). In the rat ( Swanson-2004 ) and mouse ( Hof-2000 ) it is composed of two subdivisions, a distinctive anterior hypothalamic nucleus and an undifferenctiated anterior hypothalamic area proper.